New Arizona Poll Has Legalization in Dead Heat . A poll from Data Orbital released Friday has the Prop 205  legalization initiative in a statistical tie. The poll had support at 45%, with 44% opposed, 5% undecided, and, apparently, 6% unaccounted for. Pollster and political consultant George Khalaf said the "no" side was making gains because of heavy TV advertising in recent weeks. "It's not that good for a proposition to be this far below 50%," he said of the "yes" side. "It's not a great sign for legalization, unless they outspend (the 'no' side) in next few weeks or younger voters' turnout is larger than anticipated." Discount Tire Kicks in $1 Million to Defeat Arizona Legalization . The Scottsdale-based Discount Tire Company has contributed a million dollars to Arizonans for Responsible Drug Policy, the group leading the "no" campaign against Prop 205 . The company is the largest privately held company in the state, and has also contributed to controversial Sheriff Joe Arpaio. The "no" campaign has also seen recent large donations from Empire Southwest for $200,000 and SAM (Smart About Marijuana) Action for $115,000. Delaware Poll Has Solid Majority for Legalization . A new poll from the University of Delaware's Center for Political Communication has support for marijuana legalization at 61%. Only 35% of respondents said they were opposed. The poll comes as state Sen. Margaret Rose Henry (D-Wilmington) says she plans to introduce a legalization bill when the legislature reconvenes. 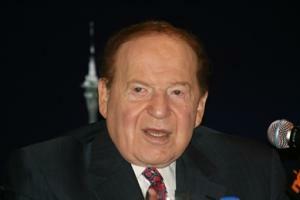 Sheldon Adelson Kicks in $1 Million to Defeat Massachusetts Legalization . Las Vegas casino magnate and ultra-conservative philanthropist Sheldon Adelson had donated $1 million to the Campaign for a Safe and Healthy Massachusetts, which is leading the opposition to the Question 4  legalization initiative. Even with the Adelson money, however, the "yes" side has out fundraised the "no" side by a margin of two-to-one. Yes on 4 has raised more than $3.3 million, while the opposition has raised only $1.6 million. Trump Talks Drug Policy, Demands Hillary Take Drug Test . Donald Trump sketched out a policy aimed at the heroin and opioid crisis during a speech in New Hampshire Saturday, but it was largely drowned out by his call for Hillary Clinton to undergo a drug test before their next debate. Trump said he suspected she was on something during the last debate. When it came to heroin and opioids, Trump said he would solve the problem by building a wall on the Mexican border, moving to reduce the prescribing of opioid pain medications, and resorting to mandatory minimum sentences for drug offenders. Scottish National Party Backs Medical Marijuana .Meeting at its annual national conference, the Scottish National Party backed the medicinal use of marijuana. The vote doesn't necessarily mean the Scottish government will adopt medical marijuana, and drug policy is an area specifically reserved to the UK national parliament, so that body would have to act as well.